Falling in love is a strange event and as momentous as a star being born or a natural disaster occurring, depending how you feel about it. This may alternate, some days it feels fantastic as if no harm will ever occur again and the world's a blue sunny everlasting glory, but other days feel as awful and diabolical as the worst clunk dunk lost your biscuit day, ever. By now, many people know I fell in love when I took my poetic journey to America. Walked blindly into a pheromone storm, an enveloping cloud of chemistry, fate and magic - no other way to explain it. This wondrous experience still has me reeling, amazed and also, happier than I've been for about ten years. A long time to have resisted romance, but my will's as strong as petrified wood. A ridiculous simile except this blog is as much about trees as it is about friendship, and yes, in my mind romantic love has to be about friendship first, or it's just not worth the scary times and worry which inevitably exist all about luuurrve, an atmosphere of R I S K.
Human beings with any kind of nous may like to weigh up risks, measure odds, see the likelihood of winning, before we take a punt on any new venture or dare to step into unknown, or uncertain territory. Just as we may hang back in affairs of the heart til we feel sure we're going to be well received and for some time, we could view the idea of planting more trees to save the planet as an unproven method of bettering our life, til we've seen facts and figures, probable results. Human beings have removed half the world's trees since we evolved into homo sapiens on this planet. We developed and adapted from creatures who were hunter gatherers, homo habilis used tools. At first then we used a few tools and found shelter where possible, in caves and so on we can imagine but gradually as we developed our technology, trees, their wood, branches, roots, leaves, fruits and seeds became an important natural resource. With a low human population, (relative to today) on the planet too, we didn't need to regenerate the trees ourselves, could simply move along to a new area and use those trees. It was also true that when weather cooled we moved to warmer places, so we travelled as a life-style, following spring and summer, tracking game which also moved on. A sobering thought when we think Africa was once a lush garden, a teeming jungle of a continent rich with plants, trees, animals, food and water. Our origins were there, it's believed, (you could call it Eden and since we're all believed to have evolved from a man and a woman in Africa, they were Adam and Eve, but their names would've been in another language). The African Bushmen spoke in clicks, considered to be our first language and that tongue is now extinct, no one speaks it any longer. I can imagine two people at the beginning realised they could talk, could develop language and other human beings around them could not or were not so hot at story-telling. Those two first story-tellers started the story going, made themselves the stars, developed concepts of God, of good and evil to explain the mysteries of life. As African lush lands slowly dwindled they felt they were banished from the glorious garden, made to go out into the world with their then children and search with the knowledge they had, not with instincts like other animals. No one then quite realised human beings could've changed the garden for the worse, could've made so much of Africa turn into dust. Or did they develop their own version of spin, to feel good about themselves? Now, we know we do affect where we live. So we've moved on and the world resounds with the sounds of human beings, jets break the sound barrier with a boom they go so fast, we have noise pollution there's so much sound in some places, (traffic, music, talking, industry, machinery, phones ringing, trains).... and messages come at us from all directions. We're told to do this, buy that, save this or the other thing and look out, beware, see this or that as vital and do what you are told, soon, yesterday, immediately, or all at once. My message to plant more trees appears in a storm of directives and missives, but I'm hoping love makes the message clearer. Friends who I visited in America love me and I love them, we're connected with such strong bonds of friendship they've lasted for twelve years of online messaging, and as writers we've learnt a great deal in our exchanges. Our regard and respect for each other passed muster when we met in person, despite differences of opinion or misunderstandings, culture shock and general peculiarities. And I was happy to buy trees to plant in Australia, where they need them, to cover the carbon cost of my trip. It was also a delight to buy one American friend a climbing rose for his garden and then, on my return to plant a Ballerina apple tree in memory of Jimi Hendrix who will always have this special place in my life, after some fantastic days in Seattle, (where he's from) with his music playing while we drove seemingly all over the entire city, (words cannot really describe the magic of the place). I wanted to plant trees all the way across the continent. Most friends in America were pleased to show they had lots of trees where they lived. It was as if they were saying, 'It is okay. You do not need to buy trees for us. We have forests of them, hillsides of trees, fields of them, look.' And so they did. But still we need more trees and if you are concerned about what you can do to slow or halt or reverse global warming, (which is certainly a reality, please just look at the heatwaves blasting through summer this year), then plant trees and plant as many as you can, anywhere they are needed. There is still also no poem as lovely as a tree. Please take care when digging to ensure no drains or wires are below. Check the best place to plant your tree or use a reputable service to plant for you. Make sure to plant trees in the correct season for each variety chosen. 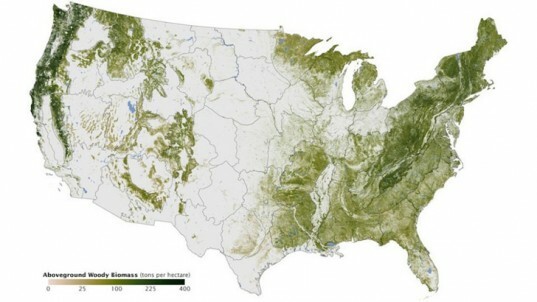 Below is a map of where all the trees are in America. I'd love to see this map in ten years and the green to be double, triple or quadruple what it is now. This could happen if human beings disappear too of course, countless trees could possibly seed new generations of saplings once the extreme weather cooled (if it ever does without our assistance), but wouldn't it be better to make the planet safe and hospitable so we may survive to see the future? I do not want the oceans to die by 2030, which they may do with acidity rising as they absorb more and more carbon. Going vegetarian or vegan is also an excellent way to reduce your carbon footprint. No matter where you live it is always possible to grow something else, another plant, another herb, a new tree, a kind thought and a better way of life. Please, plant trees and do it today, immediately. Plant as many trees as you possibly can and do this well. Love you, love trees, love the planet. Thanks for reading and comments are most welcome. I should tell you that I'm not the photographer (although I know who the photographer is and I'm sure he wouldn't care). I was with him when he took the picture, and he gave me a copy of all his photos. It's of a cyprus swamp in Mississippi just outside of my home town along the Natchez Trace. O it's gorgeous, thanks for the information. I shall pop that on there soon. I hope to get to the American south eventually. Always wanted to go to New Orleans. If I did go then I'd also go to lots of other places and I love the Mississippi because of Mark Twain's writing. I also grew up by a river, the Waikato in Aotearoa New Zealand. O I did get to the south of amrka and did see the mighty Mississippi, the stories are on here, a couple of years back. Wow, what a road trip from Iowa.